LED SpotCommercial Lighting InfoWhy LED or HID Light Fixtures In Commercial Lighting Projects Makes Sense! Setting up commercial lighting around or inside of a business building is an involved venture that requires excellent technology to pull off. Cities around the country are enacting regulations for improved energy efficiency and reduced light pollution. This can be difficult or overly expensive to do with outdated illumination technology. As a result, high intensity discharge (or HID) fixtures are becoming more and more popular for exterior projects. Incandescent and fluorescent bulbs are still useful for interior projects because they provide ample illumination while also adding some color to the space. In either situation, LED technology is also an effective way to approach an illumination project. Incandescent and fluorescent fixtures are usually just not powerful enough to handle exterior commercial lighting projects. While they can add a decorative touch and help render certain colors, they have trouble generating enough luminous efficacy to be a realistic option. Fortunately, HID fixtures can fill this role with ease. HID illumination, usually in the form of metal halide or sodium vapor lamps, is more powerful than comparable fixtures and lasts much longer. Most areas of the country now largely feature HID fixtures, though LED technology is growing in popularity. Metal halide and sodium vapor lamps consist of a chamber filled with argon or xenon gas along with various metal vapors (typically mercury or sodium). When turned on, an electrical current excites the gas, which causes electrons to move faster, smashing into metal vapor atoms. This causes the electrons to change their orbiting patterns. When the electrons return to their initial position, they emit energy in the form of photons. This form of commercial lighting creates high amounts of luminous efficacy that can be easily controlled and customized. For example, low pressure sodium lamps produce nearly monochromatic yellow illumination. This low level illumination is ideal for decoration or for areas that require minimal light pollution. Metal halide and high pressure sodium fixtures can produce close to white illumination, ideal for high visibility and accurate color rendering. LED technology is the most efficient form of commercial lighting there is, and it is also highly customizable. While metal halide and sodium lamps can last for about 25,000 hours before they need to be replaced, LED lamps can last for about 50,000 hours before they should be switched out. Their extremely high efficiency means they require little energy to function and engineering improvements are making them more versatile and more powerful. 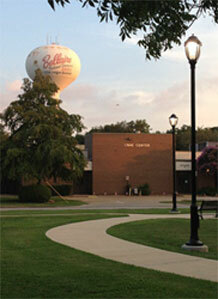 These fixtures can improve illumination around the outside of the building or in an adjoining parking lot. This provides additional safety and curb appeal for the building. Inside, incandescent and fluorescent fixtures can provide enough illumination for most spaces. However, LED and xenon fixtures are also effective at producing efficient illumination inside. When starting any commercial lighting project, it’s important to find a vendor that represents several manufacturers.Companies that only sell one brand of illumination technology may offer substandard fixtures or outdated technology to their clients as part of their vendor agreement. A company that is partnered with several manufacturers, though, will be able to provide an objective approach to any project, ensuring the best possible fixtures are installed in and around the property.